For Christmas, Santa brought Caleigh a Beans & Rice table. 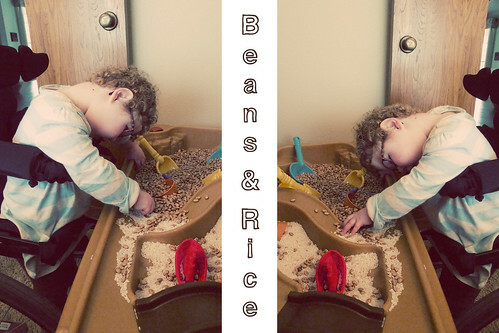 Santa was clever and decided to use beans and rice instead of sand and water. I'm not sure if the table manufacturing people know this or not, but sand and water usually end up in a mud-like mixture. Yuck. Santa knew how much Princesses don't like to get dirty. 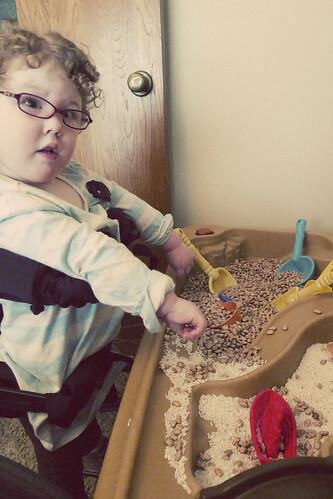 Caleigh stands at her table everyday and plays with the boats, shovels and pots. Sometimes we do it while she is in her KidWalk, but most of the time she does it while we are helping her stand on her own. 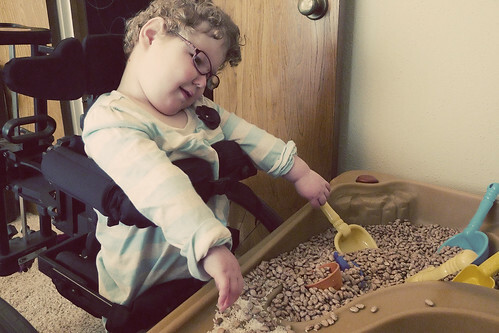 It's been a wonderful tool to making standing fun. Santa might have been a little overzealous when he brought the beans and rice for the table. Mommy and Daddy have been eating a lot of the left over items since Christmas. Super fun and tastes good too!